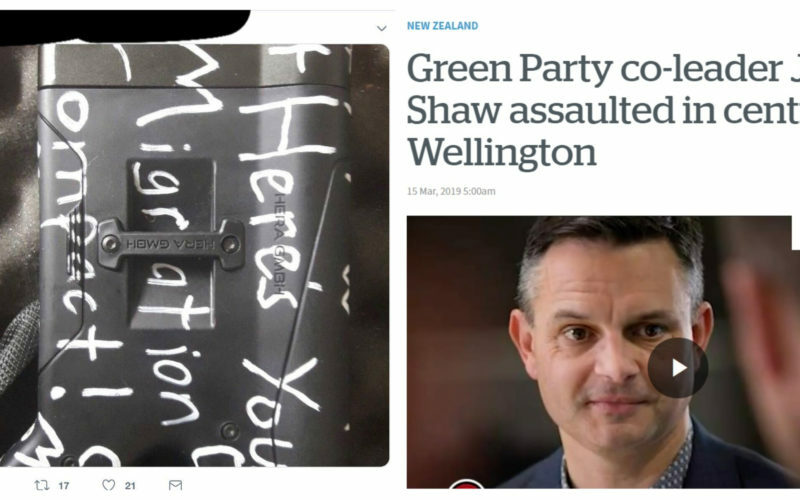 A series of violent incidents gripped New Zealand last week: first, Green Party co-leader James Shaw was assaulted unprovoked by a stranger while walking to Parliament. The second was the heinous terrorist attack that hit Christchurch’s Muslim community a day later, killing scores, by a right-wing extremist. 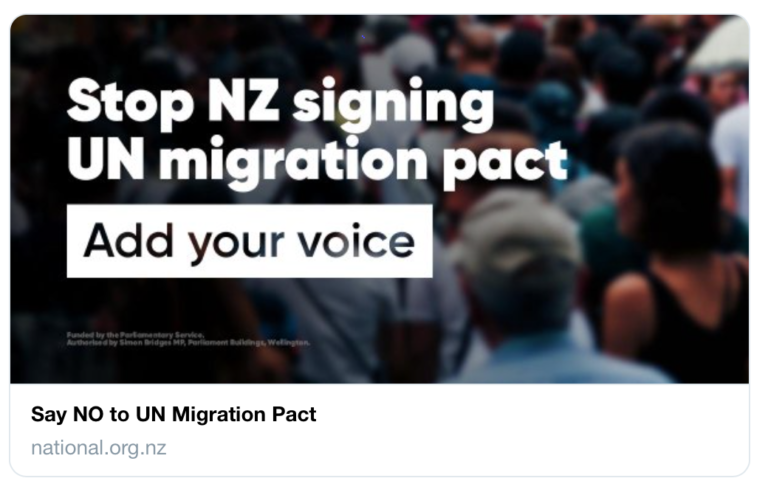 Both attacks had a common denominator between them: the perpetrators were angry about the United Nations Global Compact on Migration that was supported by the New Zealand Government last year. The man who assaulted Shaw was reported to have “shouted about the United Nations”, while the Christchurch terrorist wrote about the UN Compact on one of the firearms he used in his killings. 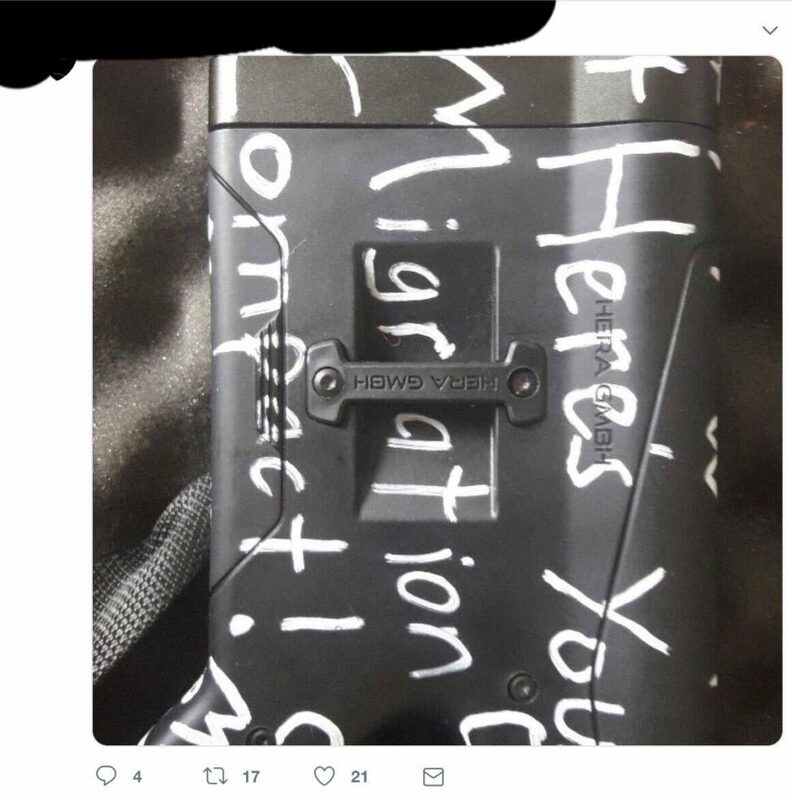 The Christchurch terrorist wrote: “Here’s your migration compact!” on one of his firearms, alluding to the UN Global Compact on Safe, Orderly and Regular Migration. The UN Global Compact was a non-legally binding resolution endorsed by the UN General Assembly in December 2018, which had the support of 152 countries including New Zealand. Our Government’s decision to support the Compact flooded social media with right-wing conspiracy theories and outrage, with the general sentiment being that the document virtually surrenders our country’s “sovereignty” to the global body. Such outlandish claims were only amplified by many of our politicians, mostly from the National and New Conservative parties. In an obvious campaign to win voters, they demonized the UN Compact into something it was not. 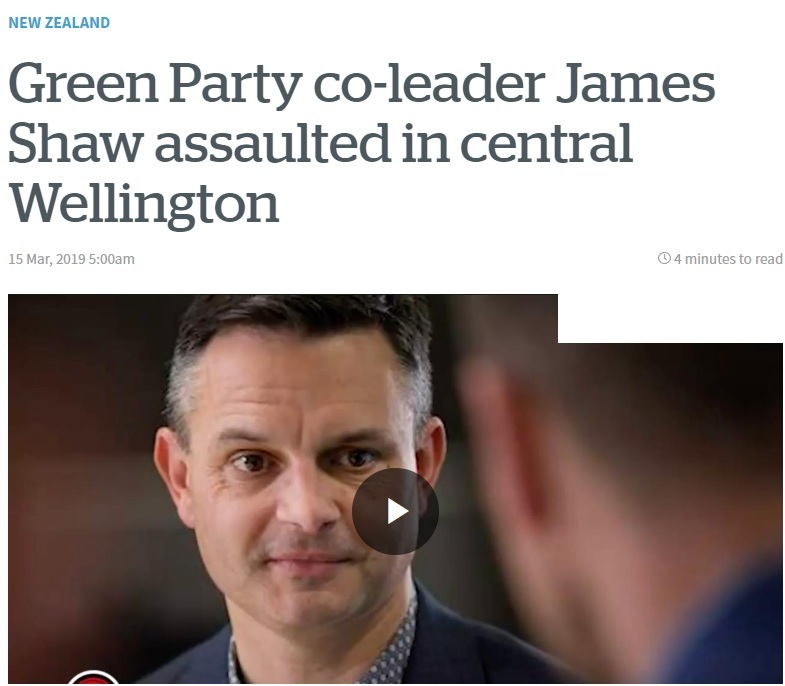 It was reported on Thursday that Greens co-leader James Shaw was attacked unprovoked while walking to Parliament. National, the largest party in Opposition, pushed the idea that the Compact would lead to “open global borders”, a “restricted immigration policy”, and again a “weakened sovereignty”. 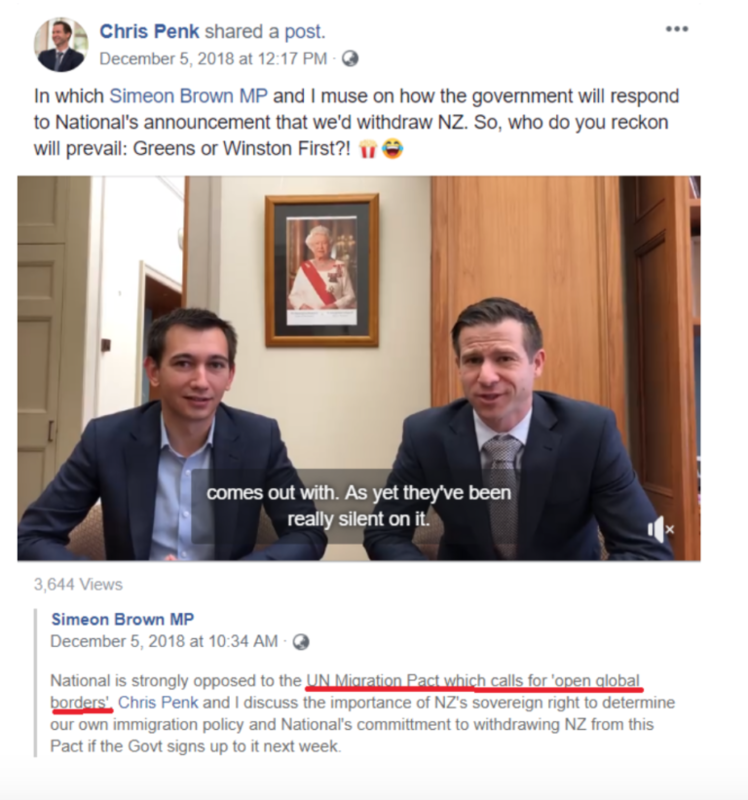 Their leader, Simon Bridges, took part in this fake news campaign but the loudest were by far neophyte MPs Simeon Brown of Pakuranga and Chris Penk of Helensville. The National Party created many petitions, such as this one, attacking the UN Compact. Simeon Brown (shorter one) and Chris Penk appearing in a video scaremongering about the UN Compact. 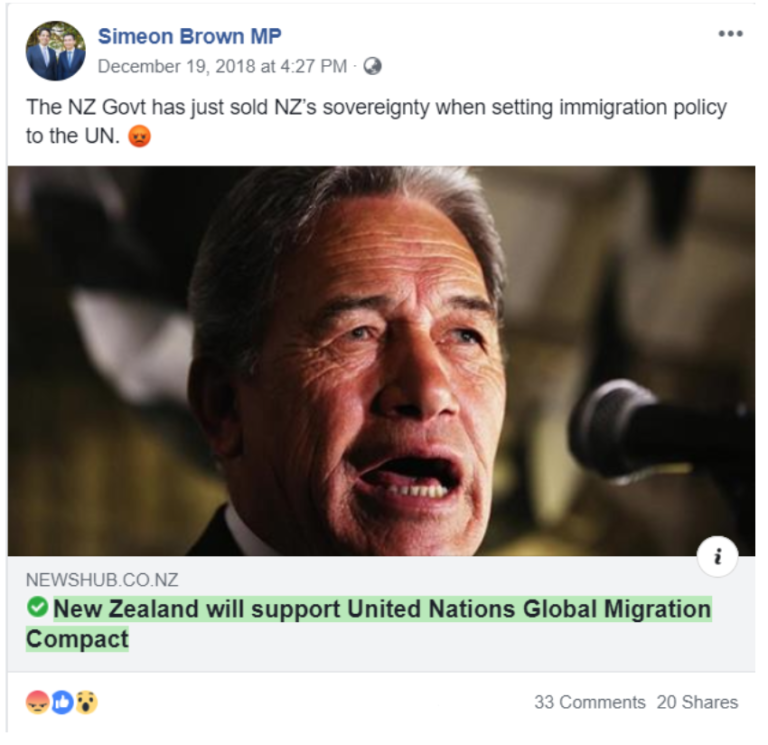 Brown explicitly targeted Foreign Affairs Minister Winston Peters, knowing the latter has support from conservative voters. The Pakuranga MP then made the false claims that the Minister – as part of the NZ Government – had “sold New Zealand’s sovereignty”, in a bid to enrage those voters. Screengrab from Simeon Brown’s Facebook page. 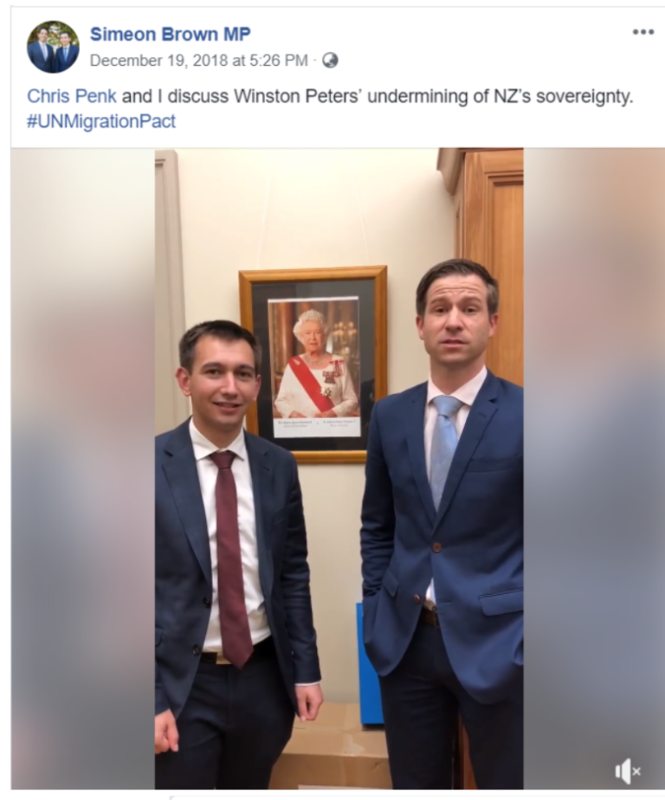 Chris Penk shares a video of himself and Simeon Brown stating that the UN Compact called for “open global borders”. 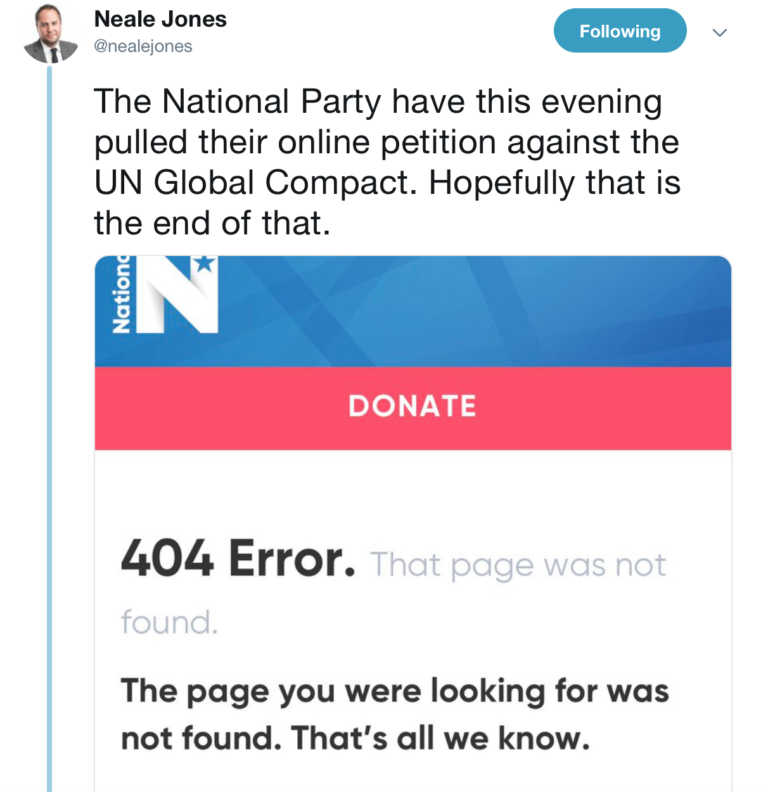 In the aftermath of the Christchurch terrorist attacks, after it was made public that the perpetrator was obsessed about the UN Compact, social media assets belonging to the National Party quickly deleted all traces of their opposition to the Compact and turned to full-pledged virtue-signalling. In the screenshot below, it can be seen that the social media campaigns attacking the UN Compact – including their petition against it – had been removed from the internet, pre-empting a backlash. However, the same could not be said for the New Conservative Party – who were far louder in bashing the UN Compact than National were. The remnants of Colin Craig’s political vanity project has been establishing itself as the main “conservative” force in New Zealand, thus spreading lies about the Compact was part of their strategy. At the time of writing, the NC have not removed traces of their UN Compact bashing from their social media accounts. Many of their posts are deliberately inciting anger, while the people commenting on such posts are brazen in their hatred of the Government and the United Nations also. Screenshot from the New Conservative NZ Facebook page. Much like National, the New Conservatives claimed the UN Compact would weaken sovereignty and “controlling [sic] of our own destiny”, but went further by saying it impacts free speech also. The Party was definitely the most prolific in spreading such disinformation, since they actually organized public protests to echo these conspiracy theories. The largest of such protests occurred on the 9th of February, which was done in Auckland, Wellington and Christchurch, but was only attended less than 100 people. New Conservative deputy-leader Elliot Ikilei addressing protesters at an anti-UN Compact protest. Their deputy-leader Elliot Ikilei, who finished last in the Manurewa electorate race during the 2017 general elections, is a staunch social media activist and was integral in organizing these protests. He has also become the New Conservatives’ public face in media interviews, where he can be often heard giving a dissenting opinion towards drug reform and LGBTQ+ affairs. 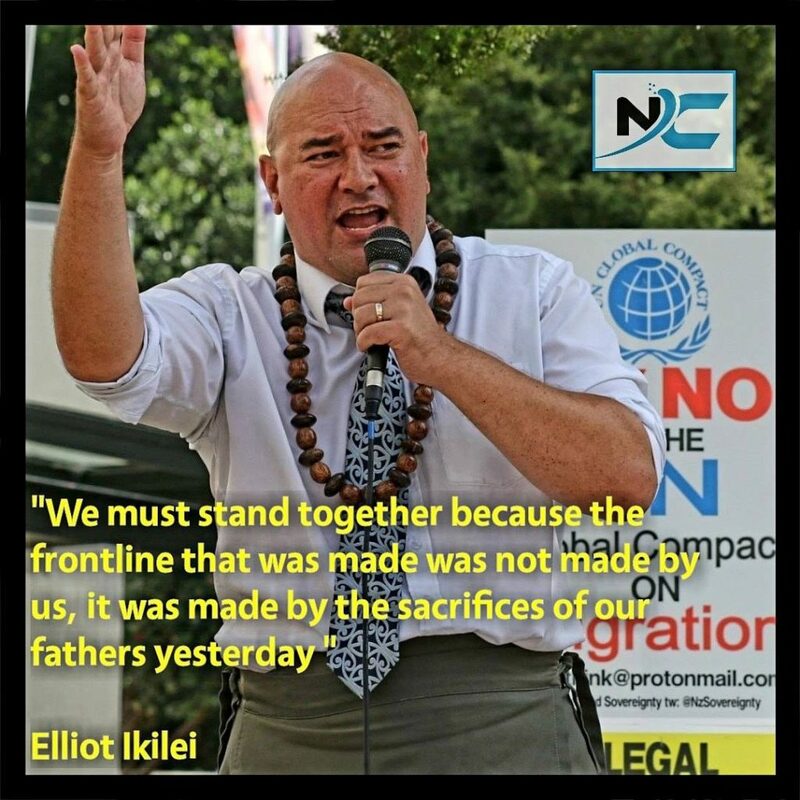 Ikilei was also one of the speakers in the UN Compact protests, the content of his speech is unknown but it can be guessed that it is identical to the New Conservative NZ Facebook page views’ on it. Taken from the New Conservative NZ Facebook page. 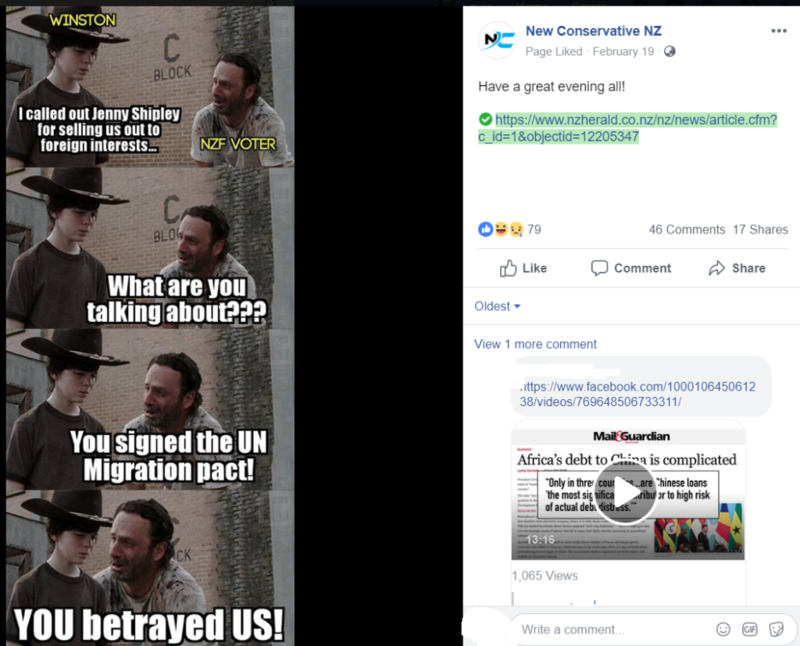 Screengrab from the New Conservative NZ Facebook page. However, Ikilei is not the only prominent member of New Conservative to be making such ridiculous claims about the UN Compact. 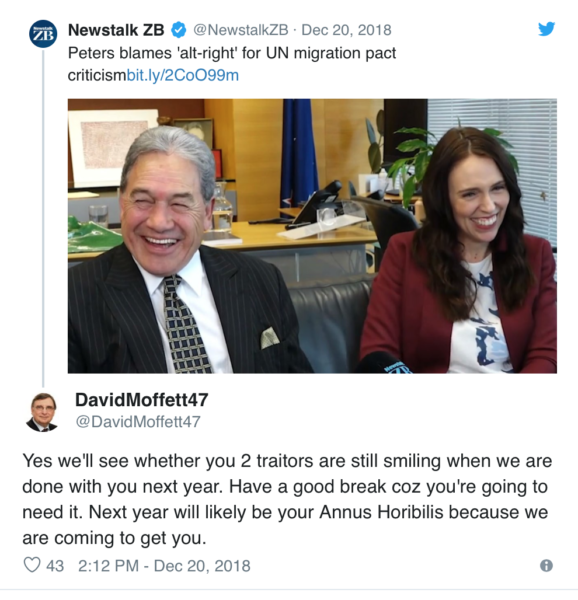 One of their board members, former Rugby NZ boss David Moffett, attracted criticism for threatening Prime Minister Ardern and Peters on Twitter. New Conservatives board member David Moffett on Twitter. Moffett called the two leaders “traitors”, and threatened that he and others “are coming to get you” by next year – the post was made in late 2018. That kind of aggressive behaviour is the same level of hatred that the Christchurch terrorist, and most probably the man who assaulted James Shaw, had. When you have individuals with such prominent profiles creating widespread disinformation and outlandish theories about the UN Compact, it is no surprise that there are many people who are enraged about it – to a point where they punch a stranger on the streets, or mass murder scores of people inside places of worship. Do these politicians want to be voted into power so desperately that they would risk breeding right-wing extremism just to achieve it? Because the kind of rhetoric displayed by bother National and the New Conservatives is nothing short of incendiary, and would not doubt be enough to light-up another lunatic from committing acts of violence. Good post Louie. The Nats should be ashamed of themselves. Thanks Julie. And based on social media presence, the Nats are being hounded left and right also.